Ear infections can affect both children and adults. Take antibiotics as prescribed and finish all of the prescription. This can help prevent antibiotic resistant infections or incomplete treatment with the infection returning. Otitis media, or a middle ear infection, is inflammation located in the middle ear. Otitis media can occur as a result of a cold, sore throat or respiratory infection. Tympanometry is a test that can be performed in most physicians' offices to help determine how the middle ear is functioning. It does not tell if the child is hearing or not, but helps to detect any changes in pressure in the middle ear. This is a difficult test to perform in younger children because the child needs to remain still and not cry, talk or move. What are the effects of ear infections? What are the different types of ear infections in children? How can ear infections be treated? If fluid remains in the ear(s) for longer than three months, your child's physician may suggest that small tubes be placed in the ear(s). This surgical procedure, called myringotomy, involves making a small opening in the eardrum to drain the fluid and relieve the pressure from the middle ear. A small tube is placed in the opening of the eardrum to ventilate the middle ear and to prevent fluid from accumulating. The child's hearing is restored after the fluid is drained. The tubes usually fall out on their own after six to 12 months. Your child's surgeon may also recommend the removal of the adenoids (lymph tissue located in the space above the soft roof of the mouth, also called the nasopharynx) if they are infected. Removal of the adenoids has shown to help some children with otitis media. Treatment will depend on the type of otitis media your child is suffering from. Consult your child's physician regarding treatment options. 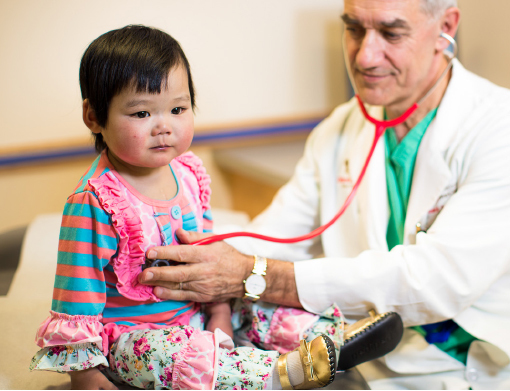 Our pediatric ENT (otolaryngology) experts provide advanced, comprehensive services for children. More than 80 percent of children have at least one episode of otitis media by the time they are 3 years of age. Otitis media, a common type of ear infection, occurs when there is inflammation located in the middle ear. It can be a result of a cold, sore throat, or respiratory infection.